Wild ginger is becoming one of my new favorite flavors. If you’ve never heard of it or worked with wild ginger, it’s different from regular, store-bought ginger: Less pungent, but more floral and complex than the ginger we all know and love. I recently wrote about wild ginger, both the Eastern and Western varieties, and about it’s largely unwarranted reputation as a kidney toxin. If you are concerned about the wisdom of eating small amounts of wild ginger, read that article. But the short version is that in moderation, and in recipes like this one, you’ll be fine unless you are working with bad kidneys already. You can also do this ice cream with regular ginger, too, although it will not be quite the same. And the method works with most any herb. Mint is a great alternative, and, as I am in the high Sierra a lot lately, I am using wild mountain pennyroyal for this ice cream these days. Never heard of it? I’ll write about it more soon, but suffice to say it is a damn good mint. 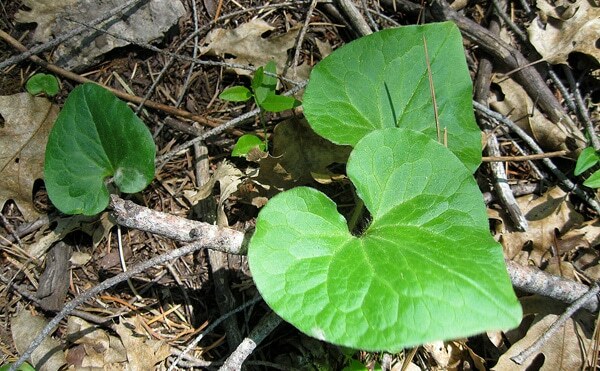 Wild ginger, if you’ve never used it, looks nothing like domestic. It’s not even in the same family. Many cooks, even trained chefs, don’t realize that almost all the flavor in wild ginger is not in the rhizome — as it is with store-bought ginger — but in the leaves and stems. So if you want that wild ginger flavor, leave the rhizome in the soil and clip the stems and leaves. This also happens to be good foraging practice because you are not killing the plant to make your ice cream. In some parts of the East, wild ginger is being hammered by professional foragers, so if more people realize it’s the leaves and stems that have most of the flavor, the better we will be able to manage our forests. If you live around wild ginger, I urge you to try this ice cream: Wild ginger is an addictive flavor, one that I can best describe as “clean” — not something I normally associate with something as rich and creamy as ice cream. I make this recipe with wild ginger from California, but there is another wild ginger that grows in Eastern forests. 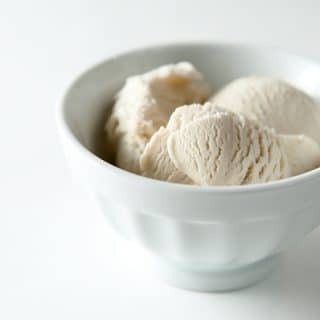 If you don't feel like foraging, you can use regular ginger for this ice cream, but the flavor will be different; more familiar to you, but different from the wild variety. Either way this makes a memorable ice cream. You will notice I do not use eggs in this recipe. And that I am using corn starch and maple syrup. This lets me do a few things: First, it keeps the color of the ice cream an austere greenish white, which immediately tells the eater that this is most definitely not vanilla. Second, it keeps the flavor pure. Third, the corn starch and maple syrup, which is an invert sugar, keep the ice cream scoopable for weeks. This is not easy to do with a regular, egg-based ice cream. Save about 1/4 cup of the milk back to dissolve the corn starch in later. Heat the rest of the milk, the cream, sugar and ginger to the steaming point, about 160 degrees. Turn off the heat, cover the pot and let steep for at least 2 hours, and up to overnight. To steep, let the mixture cool to room temperature on the stove, then pour it into a lidded container and refrigerate. Strain the mixture and pour it back into a pot. Turn the heat on medium to heat it up again slowly. While it is heating, whisk the corn starch in with the remaining milk until it is dissolved. Stir the cornstarch mixture into the ice cream base. Stir in the maple syrup. 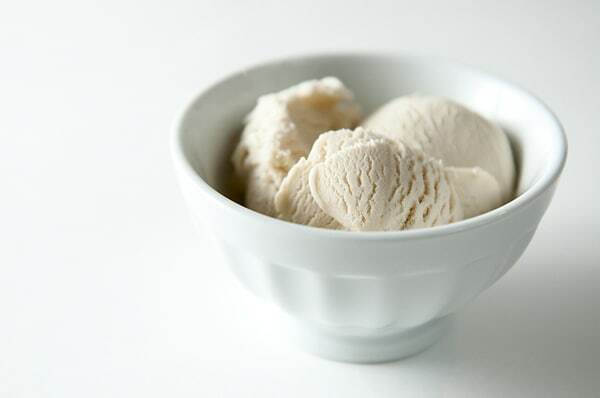 Stir the ice cream base frequently until it gets back to the steaming point, then stir it constantly for 8-10 minutes. You need to do this to get the mixture to set up correctly. Turn off the heat cool the mixture. I do this by filling a large bowl with ice and then nestling a smaller bowl inside the larger bowl. Pour the ice cream base into the smaller bowl, then stir frequently to cool it rapidly. When the ice cream base is cool, put it in your ice cream maker and follow its directions. I tried this over the weekend, and it was quite bitter. Any thoughts? I was wondering if, since it’s September, it’s too late in the season to harvest — that the flavor isn’t as good. I’m from the Pacific Northwest and have planted wild ginger in my garden. It reproduces by rhizomes, running along and under the ground. It’s slow growing and can be easily eradicated. So, find a plant in the wild, take a little piece of the root and cultivate it in a dappled shade spot. Slugs love it so make a ring from a bottomless yoghurt container as a slug barrier. Also good dried for scenting apple jelly. Hi Hank, a comment by National Ice Cream Day treat | Homosassa River Garden Club on July 15, 2012 said something about a European introduced vs a native wild ginger. Only part of that comment is showing on my computer and I cant find a way to show it all. It is preceded and followed by …. as though there’s more ? I would like to know more about the native vs introduced. Thanks !